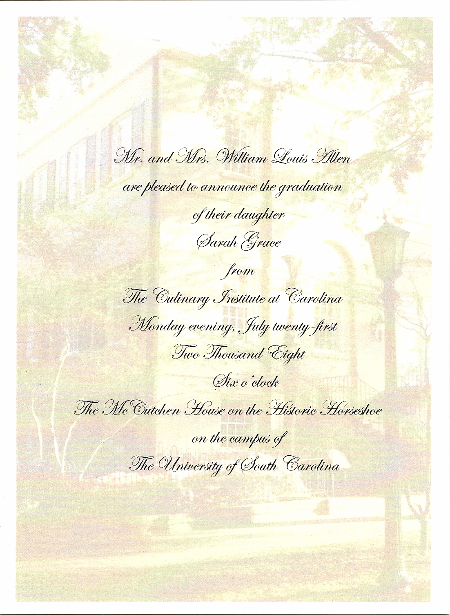 Sarah Grace's commencement exercise took place Monday night and the announcements were mailed yesterday. So what am I going to do with myself now? Talk about a crash! I don't know what happened from the last dressy event to this one, but the boys' dress clothes were mysteriously all wrong. You'd think everybody would just move up to their brother's stuff, but for some reason Brother Ahead was a regular and Brother Below is a slim or vice-versa. I foolishly thought having slacks in every normal size would be enough, but now I realize we have a veritable cornucopia of heights and widths. Same goes for shoes. Bill finally found slacks long enough for James while on a business trip to Asheville! After dress socks were retrieved from toy boxes and belts were hunted and relieved from duty as homemade rifle straps, it was on to the fun part-- finishing touches for Little Miss Sally Allen. We found a pretty party dress for Sarah but the shoes we got weren't perfect. We loved the dress-- her first real grown-up party dress-- but the shoes, although gorgeous satin sandals, were slightly heavy for the light chiffon dress. In the eleventh hour we buzzed by Stein Mart in Lexington and, lo and behold, she found the perfect shoes... in a box... not even on display. I kid you not. Afterward I kept hearing her thank the Lord under her breath throughout the day. Pamela, a fellow culinary student, had announcements printed up for the graduation and they were so elegant that we had some made in a Crane's fold-over and inserted Sarah's graduation photograph inside. Spencer, who had been practicing his hand at calligraphy, addressed them for us to mail the day after. On Monday morning Sarah and I went to the hairdresser and when we got home we learned Sarah's first ever goat had died. She'd been going down, but I had no idea she would die on Graduation Day, for Pete's sake. Sarah handled it well. 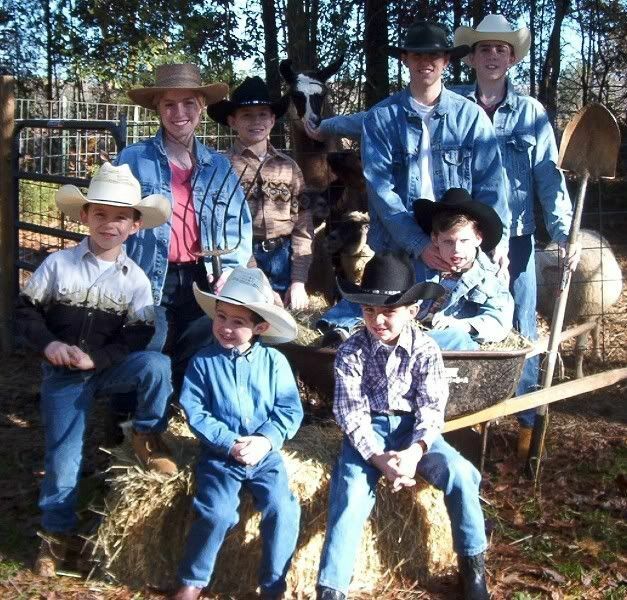 Really, with so many pets/livestock, somebody is bound to die on special days. Sugarplum, a cockatiel who was so in love with Sarah that she would get frenetically tweety and flittery whenever Sarah was near, died on Sarah's birthday.... in her hands. The boys dug the goat's grave right up until time for showers. This goat named Veronica, but nicknamed Big Whitey, was the size of a pony. When the procession took her out of her pen, her daughter moaned for her, but still, Sarah Grace did not cry. The moaning of Ida Claire almost pushed me over the proverbial brink and into abject lachrymosity, but Sarah's perfect shoes beckoned me back. We then packed up the 15 passenger milk-and-honey-acres mobile and picked up Ma, who thought she'd accidently thrown out her new impeccably matched earrings, and after a night of ear-pinching clip-on misery, wished she had. The McCutchen House, a lovely antebellum jewel, is home to the culinary school and the location of the commencement exercises. I was delighted to finally meet Sarah's classmates and chefs as I would wait up late-night to hear her tales of fun kitchen banter, Chef Soup-Nazi antics, etc. David AKA Uncle Bubba looks like an "iron chef" but is really a lovable ol' cream puff. Michael is a sweetheart and did a great job looking out for Sarah Grace, Carlton is a special young man who holds a dear place in my heart, Pamela was a mastermind and worker bee who went from one thoughtful act to another, and Josh and Jonathan were affectionate darlings who delighted my daughter weekly. Kim managed to maintain her jolliness despite a tragic house fire that interrupted her classes. Stuck was very personable and witty. Angie looks like a teenager, but to my great surprise has grown children! Thomas was extremely upbeat and warm. I also enjoyed meeting the striking Brooke and the soft spoken Angela. Hilary made me proud by bragging on Sarah Grace and I was so glad to meet Roger as the family had prayed for him through his knee troubles. Sarah Grace loves these friends to bits and I so hope they'll keep in touch. As a homeschooler, this was really Sarah Grace's first time out of the box, so to speak. In the beginning, she'd come home with news such as her first big hug from a fella other than a relative (Hi, Josh! ), her first Valentine's gift, her first time asked on a date, her first flowers, her first flirt, her first wolf call, her first crush-on-a-man-old-enough-to-be-her-father.... wait a minute.... WAIT A MINUTE!.... at which point we informed her she had used up her quota of "firsts." While we were waiting for the ceremony to start, in walked Jo our neighbor and great supporter of Sarah's culinary pursuits. I was stunned as I had just spoken to her only a couple of hours earlier while she was in Charleston on business and I had no idea she would make it. Sarah 'bout popped when she saw her! After the ceremony, Sarah changed into her party dress for dinner at Al's Upstairs and.... Mama Mia! My little Sally has become such beautiful young woman! Even though the culinary school had provided food galore, Bill wanted to take us all to a nice restaurant to celebrate more intimately. Thankfully, Jo's husband, Tim, was also able to make the dinner, as well as one of Sarah's chefs who has engaged her help in an entrepreneurial venture. No girl was ever more appropriately named. You have blessed and graced this family from the moment you were born. And with each of your beautiful smiles you make our home a more wonderful place. And so it is with indescribable pride, joy, and love that your mother and I congratulate you tonight and pray that God would bless you above anything we could ever hope or imagine. Hear, hear! I am so proud of her. I've watched her study nutrition and experiment with converting recipes into whole foods while researching the cooking methods of our ancestors from a variety of cultures. She's got it goin' on! Also, I'll post her graduation pictures as soon as I get the CD from the photographer!